Everyone knows we have certain things we need to do as we get older to keep ourselves healthy. This includes caring for not only our teeth but our general oral care. In this type of economy, people sometimes tend to put off and frequently neglect this area of their health. What a lot of people don't realize is that the rest of your bodies health is directly linked to your oral health. Now coming from a family in dentistry, I already knew that but that doesn't mean I don't need a friendly little reminder every once in a while. Our family is a little different in the way that we enjoy gifting and getting personal care gifts. We know not only how important taking care of yourself is but would rather get/give something we actually need instead of wasting money on a useless gift. The boys and I brush our teeth together all the time and they even frequently talk about the time they have brushing with Grandma. 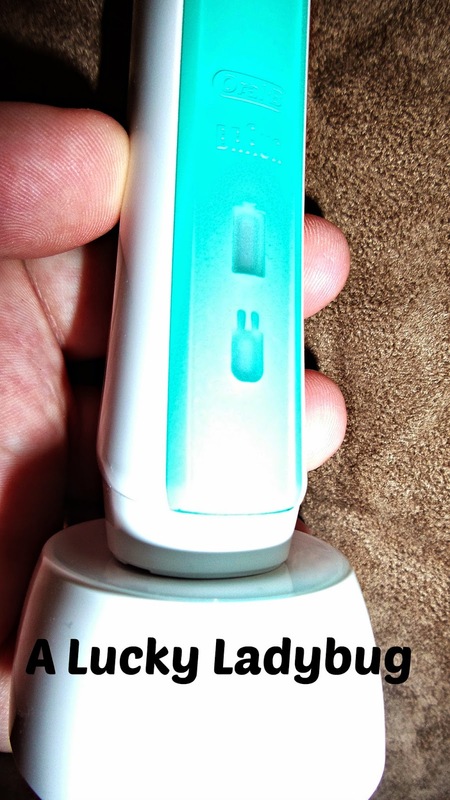 So when I was asked to review the Oral-B Professional Series Deep Sweep 1000 in celebration of Mother's Day and coming up with gifting ideas, it really wasn't something new to me! 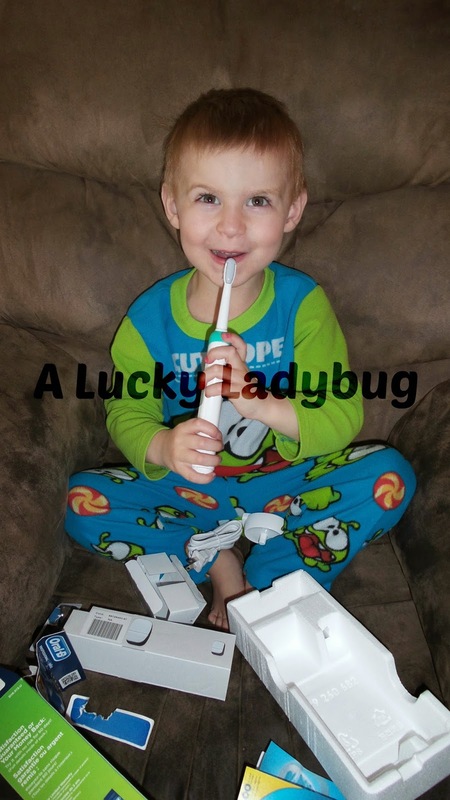 Declan loves to and in fact bugs me most days once an hour to brush his teeth. As you can see from my pictures, once this arrived, Declan felt the need to break into the box before I could even get a picture of it. We originally had a cheapy one which stopped working a while ago that we were just using without batteries. This awesome toothbrush has a triple zone motion which helps remove up to 100% more plaque than a manual toothbrush with 40,000 pulsations and 8,800 sweeps per minute. There are Indicator® bristles to remind you when to replace brush. It also signals you every 30 seconds to change quadrants. I love how powerful it feels and how easy it is to use. I prefer a hard brush because I know I am getting everything but with this one it is both gentle yet thorough at the same time! Kevin has been asking me for a new electric toothbrush for a while and I just haven't gotten around to it so he was a bit jealous of my new Mother's Day gadget! Recommendation: I loved the results I saw and about the only complaint I have is that it isn't cheaper. I'd love to grab at least one more for Kevin (maybe for Father's Day)! 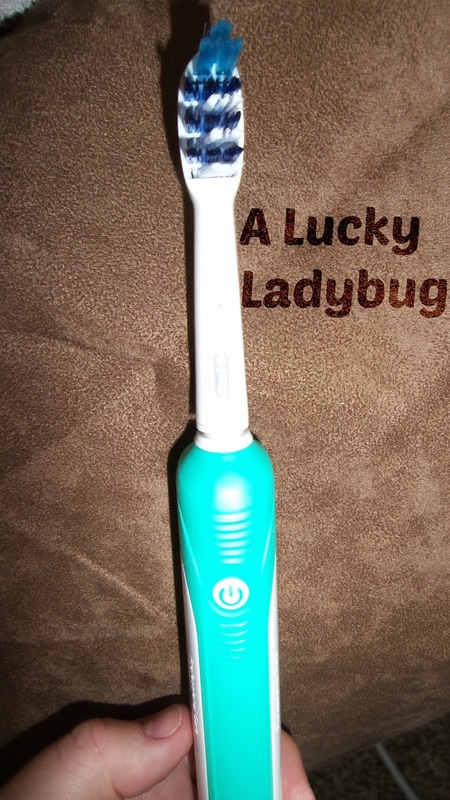 Giveaway: MLS Group is going to give one of A Lucky Ladybug's lucky readers a Oral-B Professional Series Deep Sweep 1000 of their own! The last time I went to the dentist was 2 years ago. I was 35 and had my wisdom teeth pulled. Words of advice, get them done when you are young, like late teens or early twenties. Mine never bothered me so i waited but boy was it painful. I ended up with TMJ for a bit and it really hurt. I went to the dentist about two months ago because I thought the crown was coming off. I have a visit coming up for the six month cleaning. 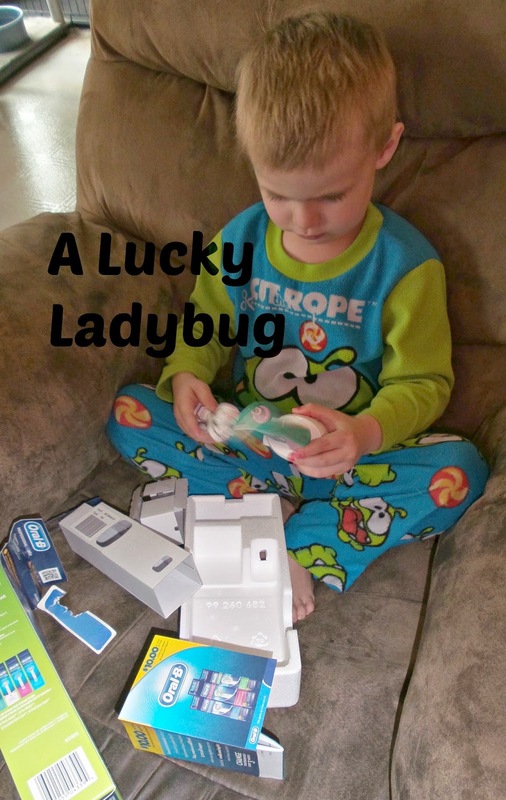 I like the how easy it is to enter giveaways but I am not a big fan of the clover leafs. The last time I went to the dentist was a year ago for a regular teeth cleaning. I have not had dental insurance which is why I have not seen the dentist twice this year. The last time I went to the Dentist was 3 months ago for a routine 6 month checkup and cleaning. I love the feel after having my teeth clean so I go every 6 months. I went to the dentist just last month for a six-month checkup and cleaning. Nothing fun. Just went this past Friday for a cleaning. I try to go every 6 months. I actually went to the dentist last Friday and it was just for a cleaning. it's probably been a year or so and it was for a tooth extraction. The end of last month for a cleaning. I went 2 months ago to get my crown replaced. 2 months ago for a teeth cleaning, I chose chocolate mint tooth paste! the last time I went to the dentist was in November of last year! my sister is actually a dentist so I got to visit her & get a teeth cleaning all at once! I went to the dentist just about a month ago for a cleaning, check-up exam and x-rays. I went to the dentist a couple of months ago to have my denture relined. Prior to that, I hadn't been able to eat solid food for three weeks! I still have real teeth on the bottom. I went to the dentist last month for a cleaning. Not sure how to be creative about that! I went to the dentist last week. TWICE. Not fun. A year ago for a cleaning. Time to get in again! I went in Jan. cause I found a black spot on an upper back tooth which was Supersensitive...going to the dentist is my least FAV thing to do, so I do try to keep up on dental care...but I still must go often enough cause they know all the grandkids by name! I went to the dentist last in November of 2012 for a back tooth that partially broke. Three months ago I had my regular 6 month cleaning & had my teeth whitened. I haven't been to the dentist in years. I went to the dentist a month ago to have my teeth removed. 3 months ago to have 2 root canals done. NOT FUN. We missed our last appt. so it's been about 10 months. We go for cleanings every six months. Thank you! I went this past March for a routine cleaning and they did xrays too,. My last visit was April 2014. It was for my 6 month check up and cleaning. No problems. Yah. I was there yesterday. Unfortunately, I have a cracked tooth and need an extraction :(. I haven't been to the dentist in maybe 3 years...It was for a crown. I am going to have to go in tomorrow. Yesterday, I was eating a oreo, and one of my teeth broke. Ugg. I haven't been to the dentist in over a year. I need to get there soon though - my teeth need a cleaning! The last time I went was many years ago to get my braces off. I went for my regular checkup and I think I got some cavities filled. I last went to the dentist two years ago before Obama took away my insurance. Last time I went to the dentist it was for an infected tooth where I had previously had a root canal. Not fun at all! It is time to go in for a cleaning. Last one was a year ago. I went to the dentist 3 months ago to have my teeth cleaned. I went in 2012. It is always so scary to me. I never get used to it. No fun. I went two weeks ago for a root canal! Next week is the first crown appointment. I went to the dentist last year for the first time in goodness knows how long. After learning I needed $5,000 worth of dental work, I about had a stroke! They had to sedate me to bring me back for a root canal and temporary crown... that's all that my dental insurance covered, and I haven't been back! I'm sure I'll need triple the root canals by the time I muster up the money and the courage to return! My routine 6 month appt is coming up actually. The last time I went to the dentist was a little over a year ago. I went because I seriously had a pain in my jaw that seared me to my soul. Long story short... There was a minute-sized piece of bone or something in my gum. Who would have thought such a small irritant packed such a mighty punch! I went to the dentist 3 months ago for my routine cleaning and exam. I went last month and it was for a checkup. December to get a tooth pulled. I went to the dentist about 6 months ago for a cleaning. I just got the reminder card in the mail that it's time for me to go again! The last time I went to the dentist was probably about 3yrs ago. I went for a simple cleaning but need to go again. I went to the dentist last year for cleaning. I went to the dentist earlier this year so I could get a filling redone. I need to go back and have my teeth cleaned and another cavity filled. I went to the dentist about 2 months ago for a cleaning. I love your giveaways and would like to see even more! I went to the dentist last month. My son was so happy to see me come in the door he ran to give me a hug and accidentally hit me in the mouth with his Transformer. It chipped my front tooth! What I genuinely like about your blog is how you cover so many different subjects. I can always find something which relates to my everyday life. It was a few years ago to get my teeth cleaned after getting my braces off. About a year ago for a checkup. I last went to the dentist in January for my 4-month cleaning. Yes I go every 4 months so I can keep my teeth and gums as healthy as possible. Getting older has lots of disadvantages! My last dentist visit was about a month ago for routine cleaning and exam. I go back in about another month for deep cleaning and filling a filling that has broken. 3 months ago to have a tooth pulled! the last time I went was 2 weeks ago for a toothache. When I went for braces. I went to the dentist a week ago for a teeth cleaning. Wasn't bad at all. Your blog is the "best" you can get for being on Blogger. I love that you don't have pop up ad issues like other blogs, this blog loads just fine, great navigation. Went to the dentist last year for a cleaning and tooth pulled. It cost me a small fortune and could not go back since. I just went a couple weeks ago and have another appointment tomorrow. I filled 2 cavities the last time, and get another one filled tomorrow. Last time I went to the dentist was back in January. What a great birthday present, not really! I went to get my teeth cleaned! It was a nightmare, I waited 3 hours to even be seen. I went to the dentist about 4 years ago. Since I don't have dental insurance a family friend told me about a day dentists were having for the community. The dentist wound up pulling six teeth. Ouchhhhhhhhhhhhhhhhh! I may be the only one but I dislike the design of your website. I enjoy reading it but I don't like all of the green color and the large bug is disconcerting. I went to the dentist a few days ago for a cleaning. It was okay no cavities. I went to the dentist 6 months ago for a cleaning. I went in Feb for a cleaning. Thanks for the giveaway… visited my dentist last week: lost a crown...swallowed it while eating...later recovery unsuccessful !